Swaraj said that India had asked Pakistan to give visa to the mother as well while voicing concern about their safety. 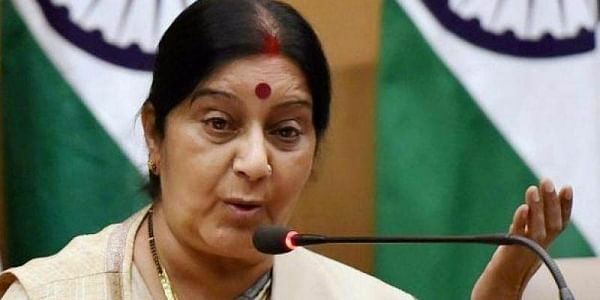 NEW DELHI: After the Pakistan government decided to allow both the mother and wife of Kulbhushan Jadhav, the Indian national who was sentenced to death on espionage charges, to meet him, External Affairs Minister Sushma Swaraj on Friday said that she has informed his mother about this. "Government of Pakistan has conveyed that they will give visa to the mother and wife of Kulbhushan Jadhav," Sushma Swaraj tweeted. "I have spoken to Mrs. Avantika Jadhav mother of Kulbhushan Jadhav and informed her about this," she said. Stating that earlier Pakistan had agreed to give visa only to Jadhav's wife, she said that India had asked Pakistan to give visa to the mother as well while voicing concern about their safety and security in Pakistan. "We had also asked that a diplomatic officer of Indian High Commission should accompany them while they are in Pakistan," Sushma Swaraj said. "Pakistan has agreed to facilitate the visit of mother and wife of Kulbhushan Jadhav and assured us of their safety, security and freedom of movement in Pakistan." The Pakistan Foreign Ministry on Friday said that the mother and wife of Jadhav would be allowed to meet him at a prison there on December 25. A Pakistani military court sentenced Jadhav to death earlier this year on charges of espionage and conducting sabotage activities in Pakistan.